These colourful Echinaceas are blooming in Horniman Museum Gardens, in south London. They are part of the museum's medicinal garden. Planted in ten sections relating to parts of the body, the medicine garden has a range of plants used to treat illnesses. Some are traditional or local herbal remedies while others have formed the basis of modern pharmaceutical medicines. Native Americans use Echinacea to treat many ailments including wounds, burns, toothache, coughs, stomach cramps and even snakebite. The plant has been used medicinally for centuries. 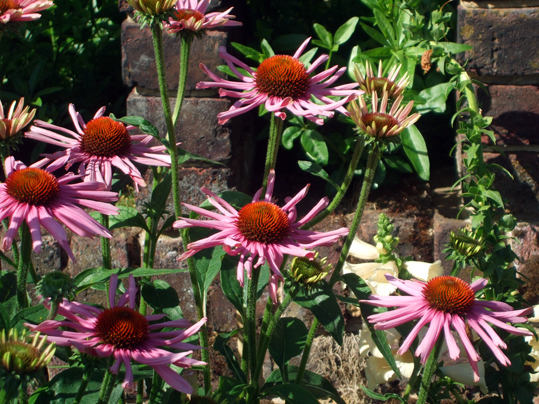 Echinacea was popular in the mid-1800s when it was used as an antiseptic and disinfectant, but its use decreased in the 1940s with the introduction of antibiotics. Echinacea extracts are now among the best-selling herbal remedies in the world. Some studies have suggested that it may boost the immune system, helping to prevent colds and flu, but others have found no proof of its medicinal properties. Magically, Echinacea is also good to use in healing spells - you could put a vase of the flowers on your altar when doing any healing magic. According to A Kitchen Witch's World of Magical Herbs and Plants, by Rachel Patterson, Echinacea lends itself very well to any kind of crone magic and is associated with abundance and power as well as healing. Rachel says: "Medicinally it is used to boost the immune system so it works well in healing spells. Add a sprinkle of Echinacea to other workings to increase their power. Keep some dried petals in your purse or wallet to attract abundance."